Ragnar to the Bears? And just how much does a mascot make? 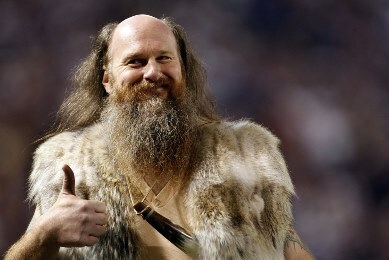 In a Chicago Tribune opinion piece, it is argued that the Bears should bring in Ragnar, the deposed Vikings mascot, as their own: "Whenever Cutler throws an interception, Ragnar will chase him up and down the sideline with a battle-ax, fulfilling every Bears fan’s deepest desire." If you haven’t had enough of Vikings mascot mania, I have a couple of hot links for you. Let me rattle off a few reasons why this is an incredibly good idea. He’s a viking and vikings are awesome. He’s a big man and will be able to help pick up the pieces of Jay Cutler when he returns from injury and is immediately injured again. It’s hard to say what the percentage of seriousness is here, but I’d put it around the percentage chance that it would actually happen (which is to say, both are pretty close to zero). Second, a big question that I’ve been asked a lot: how much do mascots really make? Along with a couple other outlets, I reported (per a source) that Ragnar made $1,500 a game last season. The Vikings went into this past offseason looking to change his role and perhaps take him out of gameday situations. And from my understanding, he countered with a financial proposal that would have paid him $20,000 per game. At that point, the sides were at an impasse. I’ve not been able to confirm that with Ragnar (Joe Juranitch is his real name, and he’s been unavailable for comment), but again that’s what I’ve reported via a source familiar with the negotiation. Mascots generally make anywhere from $25,000 a year starting out in the minor leagues to $60,000 in the NFL, NBA, MLB and NHL, said Raymond, who now runs Raymond Entertainment, a character branding and mascot training company which has created and worked on more than 100 mascots over the past 20 years. Some mascots make more, but not many. “Performers who have been there anywhere between 10 to 20 years, who are full-time salaried performers with benefits and incentives, can earn in the six-figure range, and about 10 percent of the full-time performers are reaching that level of compensation,” Raymond said. Ragnar was with the Vikings for 21 years, though the Vikings added another mascot, Viktor, in 2007. And again Ragnar was an independent contractor so perhaps there is a distinction. Also, it’s worth noting that the article makes it sound as though most of the higher-paid mascots are in MLB and the NBA, which have 41 or 81 home games instead of 10). But yes, there are mascots who make six figures. Perhaps at $1,500 per game, one could say Ragnar was underpaid and not necessarily out of bounds in asking for a raise? That said, Raymond concluded that Juranitch “overestimated his value to the team” based on the contract figures that were reported.